Devine Ozigbo scores on a 40-yard run on the game's opening drive.Devine Ozigbo scores on a 40-yard run. RUSHING: Minnesota-Ibrahim, M 18-49; Morgan, Tanner 4-35; Williams, Bryce 5-18; Green, Seth 5-17; Femi-Cole, J 1-9; Annexstad, Zack 3-minus 3. 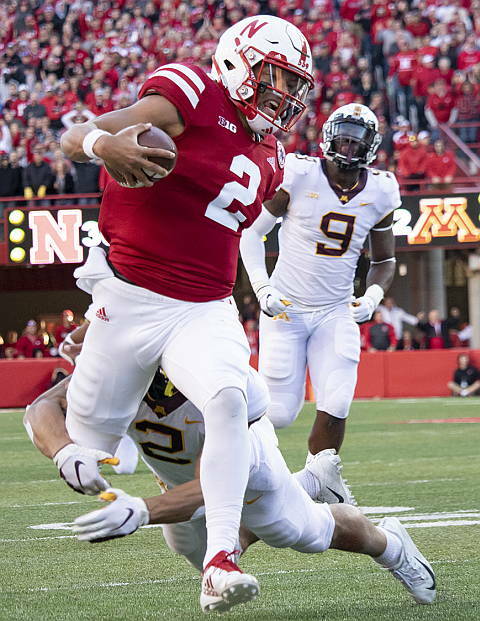 Nebraska-Devine Ozigbo 12-152; Adrian Martinez 15-125; M. Washington 14-109; JD Spielman 1-2; TEAM 1-minus 5. PASSING: Minnesota-Annexstad, Zack 9-20-0-135; Morgan, Tanner 11-16-1-214. Nebraska-Adrian Martinez 25-29-0-276; M. Washington 0-1-0-0. RECEIVING: Minnesota-Johnson, Tyler 11-184; Douglas, D 3-31; Autman-Bell, C 2-75; Bateman, Rashod 2-15; Green, Seth 1-31; Witham, Bryce 1-13. 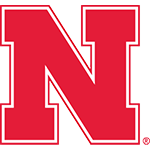 Nebraska-Stanley Morgan 10-163; JD Spielman 8-77; Devine Ozigbo 3-25; M. Washington 2-1; Mike Williams 1-7; Kade Warner 1-3. 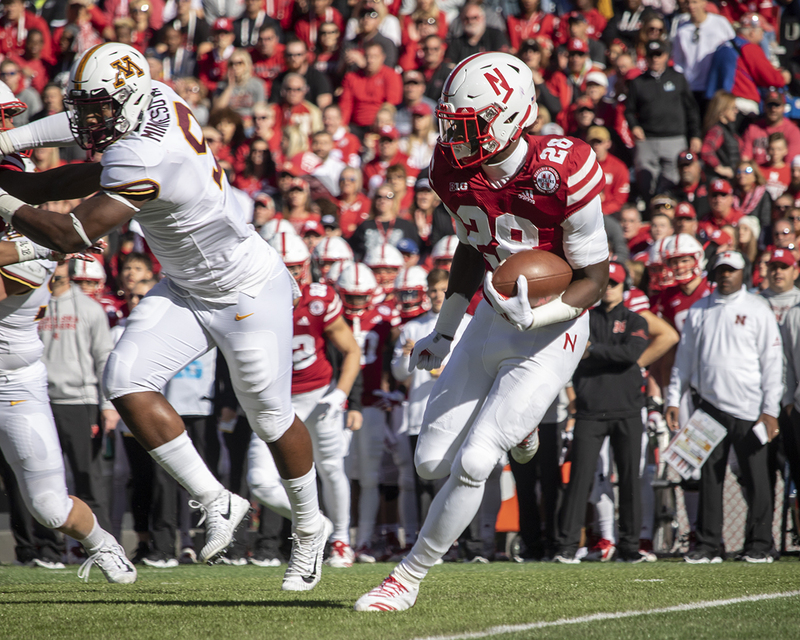 Resilient Huskers run past Gophers: Nebraska exorcised its demons to thwart a second-half Minnesota comeback attempt and roll to a 53-28 win over the visiting Gophers. The Huskers scored early and often as Nebraska notched its first win under coach Scott Frost to the delight 89,272 fans in the 365th consecutive sellout at Memorial Stadium. Nebraska’s 25-point win included several stat lines that stirred the echoes of days of Husker past, including three Big Red rushers each rolling up more than 100 yards on the afternoon: Devine Ozigbo (12-152), Adrian Martinez (15-125) and Maurice Washington (14-109). The last time Nebraska featured three 100-yard rushers was in a 56-21 win at Washington in 2010. The Huskers’ 53 points were their most against a Big Ten foe since joining the conference, as were their 659 yards of total offense. Martinez amassed more than 400 yards of total offense for the third time, completing 25 of 29 passes for 276 yards and three touchdowns. Stanley Morgan Jr. also had a huge day, hauling in a career-best 10 receptions for 163 yards and two scores, including a 67-yard touchdown in the fourth quarter that put the game out of reach. JD Spielman added eight catches for 77 yards and a score of his own. Adrian Martinez runs for 37 yards in the third quarter.Adrian Martinez runs for 37 yards. After two weeks of hearing Frost say his team had turned the corner and looked better at practice than he’d ever seen, Husker fans got to see the evidence themselves. Now it feels like the Frost era can really begin. Appreciate what you're watching in true freshman Adrian Martinez, please. As rough as the team start has been for this program, the kid was nails once again. The first win is in the books. The suffering is, at least for now, over. I felt like I was watching the 1983 Nebraska vs. Minnesota game the way the Huskers were rolling in the first half. 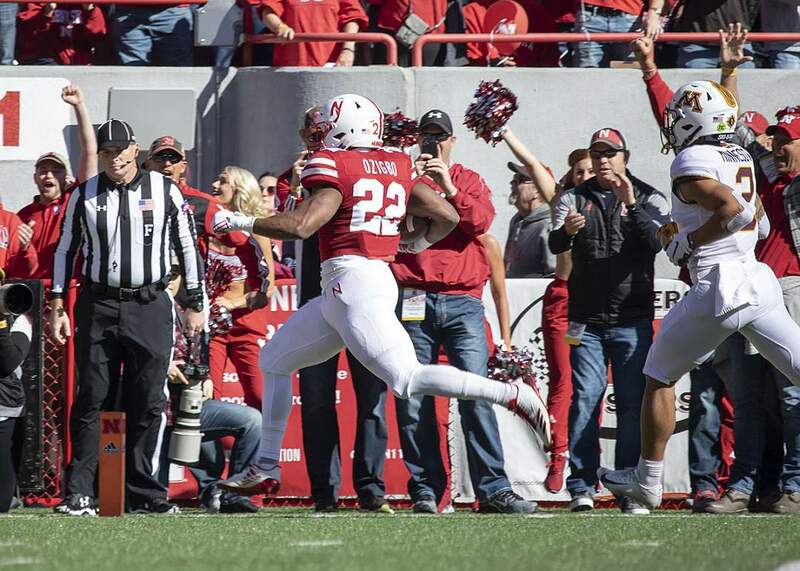 Nebraska didn’t put together a complete game Saturday but it made plays when it needed to make plays. Nebraska earned itself a night to feel good about. Yes, Nebraska football is still here — like it always was — for the hardy, the stubborn, the resilient. The Huskers averaged 8.9 per carry. They sank P.J. Fleck's row boat. It felt and looked like the beginning of something — the next step or progression for the offense. It’s becoming faster, more second nature. The record next to Nebraska may say 1-6, but the Huskers are growing up fast. The entire defense looked woefully unprepared to stop either the run or pass. That falls on Fleck but especially defensive coordinator Robb Smith.